Sabre Safety Com is a unique radio communications interface that fully integrates with your choice of Sabre Safety facemask. Available as a complete communications solution on the Vision 3, PanaSeal and PanaVisor facemasks, Sabre Safety Com is approved to EN136 Class 3. Latest approvals - Intrinsically safe ATEX approved. Also meets stringent test requirements for flame engulfment, heat resistance (EN137: 2002) and IP67 rating for water resistance and dust penetration. Fully integrated - No need for tools or dismantling of the facemask. 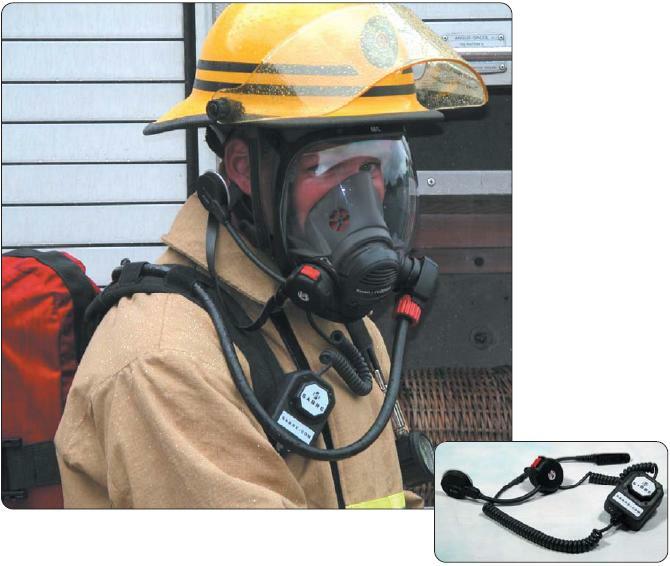 Complete ready to use communications solution that is an integral part of the facemask. Supplied with an adaptor to suit the user's choice of radio. Loud and clear - Extensively tested in high ambient noise atmospheres above 100dBA, Sabre Safety Com utilises a microphone positioned on the inside of the facemask to provide optimum clarity and excellent speech reproduction. Flexible - The flexible boom style ear-piece can quickly be positioned for user preference and comfortably sits inside modern close fitting helmets. Easy operation - The large 'push-to-talk' button is attached to the harness using a freely rotating clip, this enables the user to position the PTT button where they like. Facemask connection is through a simple 'push and twist' bayonet mechanism, allowing for simple and fast removal for cleaning. Safety as standard - Manufactured from the same glass filled polyamide material as all Sabre Safety facemasks to provide high heat, flame and impact resistance.